The Laxminarayan temple dedicated to Lord Vishnu with his consort Maha Lakshmi. 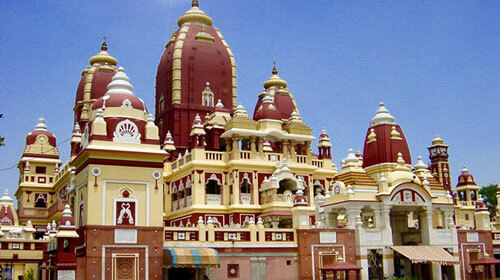 The temple is situated in Delhi and was built in between the years 1933 to 1939 by Baldeo Das Birla. The temple was built by Baldeo Das Birla and is called as the Birla House. The temple’s foundation stone was laid by Maharaj Udhaybhanu Singh. It was inaugrated by Mahatma Gandhi in 1939 and he put forth a condition that the temple would not restrict any anti Hindus from entering it. The temple is open from 4.00 am to 1.30 pm and between 2.30 pm to 9.00 pm.